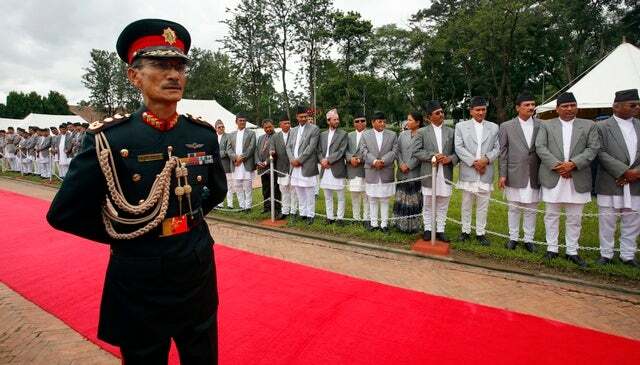 (New York) - The United States should press Nepal's army chief of staff during his meetings in Washington this week to cooperate with investigations into crimes committed by Nepali soldiers during the country's civil war, Human Rights Watch said today. Gen. Chhatraman Gurung, the chief of staff, is scheduled to arrive in Washington on April 8, 2011. In particular, the US government should urge General Gurung to order the immediate transfer of Maj. Niranjan Basnet, charged in Nepal with the 2004 murder of 15-year-old Maina Sunuwar, into police custody to ensure that he is held accountable through civilian criminal proceedings. Sunuwar's killing became a symbol of the brutal 10-year armed conflict that killed an estimated 13,000 people. "The Nepal army has steadfastly refused to hold its soldiers accountable, even when the police have shown courage and charged its officers for despicable crimes like the murder of a teenager," said Brad Adams, Asia director at Human Rights Watch. "Victims are looking to the US to show leadership and pressure Nepal's army to come clean on its wartime record." The US government has made the protection of human rights and the rule of law a priority in its training and bilateral support to Nepal. However, the army continues to protect dozens of Nepal army officers, including Major Basnet and another soldier charged with Maina Sunuwar's murder. The US provides military assistance to Nepal primarily through training, providing support for UN peacekeeping operations in which members of the Nepali military participate, and improving the army's disaster-response capacities. The US Congress has made improvements in the army's rights record, including accountability for past violations, a condition for the full normalization of military assistance by the US. The recent statement by the US Ambassador to Nepal, Scott de Lisi, that the Nepal Army had to stop protecting abusers within its ranks and to start complying with the orders of civilian courts was helpful, Human Rights Watch said. He urged the Nepal Army to stop hiding and covering up facts in the belief that "those who exercise power need not be accountable." Human Rights Watch urged officials in the Defense and State Departments to follow through on this message during the meetings in Washington. They should make it clear that it is not acceptable that not a single soldier has been brought to justice before a civilian court for grave human rights violations during the country's conflict. "In all their meetings with General Gurung, US officials should make it clear that it will not be business as usual so long as impunity reigns in Nepal," Adams said. "The killings and disappearances that characterized the behavior of the army remain an open wound in Nepal." Nepal's decade-long conflict ended in 2006 with the signing of the Comprehensive Peace Agreement between the government and the Communist Party of Nepal-Maoists (CPN-M). The peace agreement consolidated a series of commitments to human rights made in previous agreements and included many of Nepal's international obligations. Yet neither the CPN-M nor any other party has advocated establishing effective accountability processes for the abuses committed by both sides to the conflict. Even when the Maoist party led the government following the first post-conflict elections, it did nothing to bring the perpetrators to justice although the party claimed it had taken up arms because justice had been denied. In 2010, when the US denied a visa to Agni Sapkota, a leading party member, the Maoist leadership reacted defiantly to protect him. "Unfortunately, the current state of impunity for wartime abuses suits both the army and the Maoists," Adams said. "The US has taken a leading role in demanding accountability from both sides, and Gurung should hear this message loud and clear from senior officials in Washington."